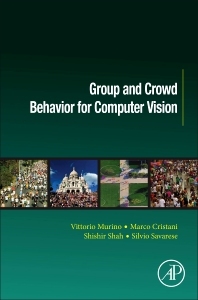 Group and Crowd Behavior for Computer Vision provides a multidisciplinary perspective on how to solve the problem of group and crowd analysis and modeling, combining insights from the social sciences with technological ideas in computer vision and pattern recognition. The book answers many unresolved issues in group and crowd behavior, with Part One providing an introduction to the problems of analyzing groups and crowds that stresses that they should not be considered as completely diverse entities, but as an aggregation of people. Part Two focuses on features and representations with the aim of recognizing the presence of groups and crowds in image and video data. It discusses low level processing methods to individuate when and where a group or crowd is placed in the scene, spanning from the use of people detectors toward more ad-hoc strategies to individuate group and crowd formations. Part Three discusses methods for analyzing the behavior of groups and the crowd once they have been detected, showing how to extract semantic information, predicting/tracking the movement of a group, the formation or disaggregation of a group/crowd and the identification of different kinds of groups/crowds depending on their behavior. The final section focuses on identifying and promoting datasets for group/crowd analysis and modeling, presenting and discussing metrics for evaluating the pros and cons of the various models and methods. This book gives computer vision researcher techniques for segmentation and grouping, tracking and reasoning for solving group and crowd modeling and analysis, as well as more general problems in computer vision and machine learning. Full professor at the University of Verona, Italy, and director of the PAVIS (Pattern Analysis and Computer Vision) department at the Istituto Italiano di Tecnologia. He took the Laurea degree in Electronic Engineering in 1989 and a Ph.D. in Electronic Engineering and Computer Science in 1993 at the University of Genova, Italy. His main research interests include: computer vision and pattern recognition/machine learning, in particular, probabilistic techniques for image and video processing, with applications on video surveillance, biomedical image analysis and bioinformatics. Associate Professor at the University of Verona, External Collaborator at the Istituto Italiano di Tecnologia, Genova, Italy and Associate Member at the National Research Council. After the Master Degree (with thesis developed partially at the Instituto Superior Tecnico, Lisboa under the supervision of Prof Mario Figueiredo), he took the PhD in Computer Science at the Department of Computer Science of the University of Verona in 2006. During the period 2004-2005 he has been Research Scholar at the University of Southern California, under the guidance of Prof. Ram Nevatia. He has been and is currently scientific collaborator of a number of national and European projects. His research interests include statistical pattern recognition, and especially generative modelling, applied to video surveillance, social signalling and multimedia in general. Studied Mechanical Engineering as an undergraduate at The University of Texas at Austin, where he received his B.S. degree in 1994. He received his M.S. and Ph.D. degrees in Electrical and Computer Engineering from The University of Texas at Austin for his thesis on Vision-based Mobile Robot Navigation and Probabilistic Feature Integration for Object Recognition, respectively. His current research focuses on human behavior modeling and analysis, scene understanding, video analytics, biometrics, and microscopy image analysis. His long-term interests are centered on the broader area of knowledge driven intelligent systems capable of seamless incorporation of semantic information through statistical decision priors and data driven feedback, with the intent of developing ‘visual decision’ capabilities that would include cognitive functions for reasoning and learning. Assistant Professor of Computer Science at Stanford University. He earned his Ph.D. in Electrical Engineering from the California Institute of Technology in 2005 and was a Beckman Institute Fellow at the University of Illinois at Urbana-Champaign from 2005–2008. He joined Stanford in 2013 after being Assistant and then Associate Professor (with tenure) of Electrical and Computer Engineering at the University of Michigan, Ann Arbor, from 2008 to 2013. His research interests include computer vision, object recognition and scene understanding, shape representation and reconstruction, human activity recognition and visual psychophysics.